Powered by iSoftBet, Disco Double slots comes with 5 reels and 20 paylines. The game is all about glitter and colours, and you will surely like it for its bonus round! The numerous symbols you will see on this game are Bars, Double Bars, Triple Bars, different coloured 7s and Purple Star. But, you might want to watch out for the mirror ball as it doubles your winnings when it forms part of a winning combo! If you’re in for some disco fun, you can start this game at Vegas Spins now! You can take full advantage of the game’s features once your stake is placed! 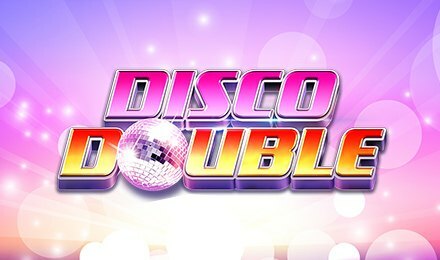 Enjoy Disco Double slots after you place your bets and watch your wins reveal themselves! Bet Levels: iSoftBet did not include the bet levels options on this game. Amount of Paylines Selection: The 20 paylines remain fixed throughout the game. Coin Values: You can select your stake from £0.20 to £20.00. The wild symbol replaces any other symbols apart from the scatter. When 3, 4 or 5 such symbols are seen on the reels, you correspondingly win 700, 5,000 or 10,000 coins. The Free Spins Feature is launched when 3, 4 or 5 scatters are seen in any position on the reels. At the same time, these combinations respectively award 1x, 10x or 125x your total stake. You are offered 10 free spins and if the mirror ball is seen on the middle reel, your winnings are doubled! Kick off this amazing slot game on either a mobile phone, a tablet or a laptop, and you might catch some blissful wins!